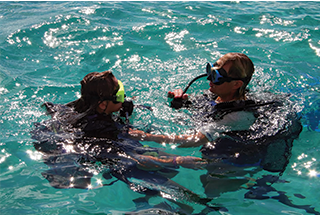 Discover Scuba Diving (DSD) is a program designed for you to try out scuba diving. 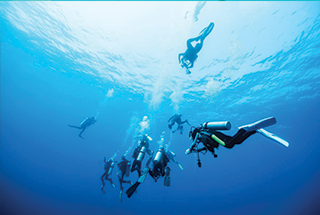 It’s not a course but an experience in which a scuba instructor will teach you the basics. Expect to learn about the safety and practical skills needed for diving and then dive under the direct supervision of a scuba professional. This experience is carried out in a pool and from a dive boat. DSD experiences count towards your Open Water Certification in case you decide to continue your underwater adventure and become a certified scuba diver. 1 pool lesson and 2 open water dives. The Open Water Diver course is the first major milestone in your new and exciting underwater adventure. Through this course, you will become certified to scuba dive at depths up to 60 feet (18 meters) without the need for professional diver supervision. The Open Water course takes you through the required knowledge, practical skills and underwater experiences that you need in order to dive comfortably and safely at such depths. 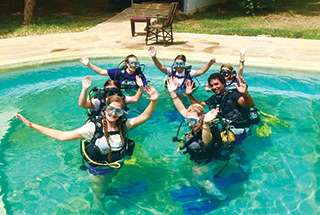 If you took part in DSD experiences or hold a Scuba Diver certification, those experiences can count toward your course schedule and shorten the duration. Take the next step in your scuba diving adventure. The Advanced Open Water Diver course is structured so that you can try out new aspects of scuba diving, enrich your knowledge and improve your skills. The course is composed of 5 Adventure Dives that you can pick from the extensive list of available specialties and the relative theoretical parts to match the dives you choose. 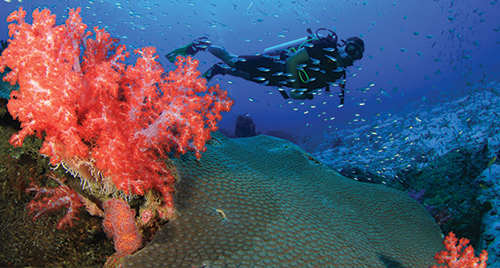 The only two mandatory dives are an underwater navigation dive and a deep dive. Pick the other 3 from what interests you most. You could for example opt to dive at night, explore wrecks and caves, or learn more about marine life. Ask your diving instructor for information about all the available options. Share your love for scuba diving on a whole new level and start a scuba career. The Divemaster certification is the entry point to the scuba diving profession and getting paid to do what you enjoy. By taking part in this intensive course, you’ll increase your knowledge about scuba diving, fine-tune your scuba and rescue diving skills and become a leader in the scuba field. Once you become a Divemaster, you will able to supervise scuba diving activities, work in the scuba field together with dive instructors and act as a role model for certified divers. Every diver should aim to get their Rescue Diver certification. This course is the most challenging yet the most rewarding. You’ll learn how to prevent and manage problems in the water, how to handle difficult situations and how to deal with emergencies. Not only will you gain the confidence to help other people in difficult situations but you’ll also be able to perform self-rescue and manage panic in more constructive ways. Part of the Rescue Diver program is an EFR course that you’ll need to take if you haven’t done so in the past two years. Welcome to join our whale shark research expeditions which have become a yearly tradition starting in 2000. We use a spotter airplane to guide us to the whale shark. Once spotted, our whale shark research team (and you) snorkel with the shark while doing photo ID, sexing, sizing and tagging with either splash tags or satellite pop-off archival tags. The trip last 4 hours and takes place every day from 10.00-14.00 starting 15/2 until 20/3 every year. We take children starting from 5 years old. After your first two dives with Whale Shark Adventures we offer a you a special rate for your additional dives. Our two tank dive package allows you to make 2 dives on 1 trip, separated by a surface interval of course. The two dives are usually performed on 2 different dive spots. We take you to one of the best reefs in Kenya, Kinondo reef for a 2 tank dive. Kinondo offers big fish, beautiful corals and a huge variety of fish. During our surface interval we look for whale sharks and dolphins, this is were we have seen most of our whale sharks.